When I grew up in Newark, N.J., in the 1970s and early 1980s, Kenneth Gibson held office as the city’s first black mayor. 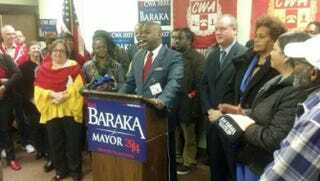 He had a famous quote: “Wherever American cities are going, Newark will get there first.” In his postelection speech Tuesday, Newark Mayor-elect Ras Baraka thanked Gibson for the phrase and repeated it. But that was Tuesday. The Saturday before the election, I was sitting in an IHOP on Bergen Street, a main thoroughfare through the city’s center. I was in the lobby, counting the minutes until candidate Baraka’s feed-the-volunteers event began. These kinds of feed-the-workers, feed-the-seniors events work well in such a small city. And Newark—24 square miles containing approximately 277,000 people—is a small city, electorally speaking: There are only 150,000 registered voters, and it’s not unusual to become mayor with just 30,000 votes in the winner’s column. I started chatting up some of the campaign workers, one of whom said she worked for the city under Cory Booker, the former Newark mayor who is now a U.S. senator for New Jersey. Booker stepped down from the mayor’s chair last year to climb to the Senate after the death of longtime stalwart Frank Lautenberg. In the Washington, D.C., circles I’m now accustomed to since leaving Newark 22 years ago to attend graduate school in the metro-Washington area, it’s assumed that Booker will become the second black president. So I had the perfect excuse to ask the question I’d been wanting to ask since I’d come back home more than two weeks ago to cover this election: Why Cory Booker? What was up with that? It was the money, the promise of investment, she replied. But he was a disappointment, she and some Newarkers told me, in almost asides: attempting to privatize the city’s water supply; Facebook CEO Mark Zuckerberg’s $100 million gift to Newark schools that didn’t trickle down past the bureaucracy; the idea, if not reality, that he was more available to NBC’s Meet the Press than he was to citizens in City Hall; his imported New York staffers and consultants; and on and on. To the national and Washington, D.C., press corps, he’s a real-life Captain America, rescuing neighbors from fires and giving powerful speeches. But to Newarkers, he was as illusory as that Marvel film image. “We voted for him for Senate to get him out of here,” she said with such seriousness that I couldn’t keep from laughing. Since there are no power brokers or bourgeoisie to offend, Newarkers—virtually all either poor or working-class Northerners—tend to be quite blunt and direct. So I believed every word she said. ‘We voted for him for Senate to get him out of here,’ she said with such seriousness that I couldn’t keep from laughing. Finally the candidate arrived. He had been in the city’s East Ward earlier, known to outsiders as the Ironbound section and to Newarkers as “Down Neck.” The East Ward, home of some of the city’s best restaurants, is an ethnic enclave of Portuguese immigrants and their Americanized children, with sprinkles of Brazilians here and there. It is a very tight-knit community, meaning that it welcomes outsiders—to come and eat, then leave. Ironbounders have their own banks, businesses and schools that they make clear they control. Baraka’s efforts to carry Down Neck failed; the whitest ward in the city went to his rival, Seton Hall University Law School professor Shavar Jeffries. Baraka is happy to be with his supporters, who are gulping down pancakes and turkey bacon. He attacks Jeffries for claiming solidarity with Newarkers based on personal violence. (“You don’t hear me saying, ‘My brother got shot in the head; vote for me for mayor.’”) Then he said something that cut me to the core: Newarkers have a self-hatred that stops them from believing they can change the city for the better. Because of that, they now believe outsiders have the solutions. It was sobering to hear that from the son of a man who proved the opposite in 1970, when that man led a black power movement that elected Ken Gibson mayor. But there it was, hanging in the air. In four decades, Newark went from a black power success story to a mecca of carjacking, then gang warfare, and now almost never-ending gunplay in an atmosphere of chronic unemployment and infrastructural decay. Baraka has made it clear to Newarkers: He’s not a superhero—not even the Black Panther, the African prince who became king of the mythical nation of Wakanda. He’s an ordinary man who needs his people’s help. But first he needs the energy and actions created from their self-confidence. If, as mayor, he can channel that, Newark will indeed enter new arenas first. Todd Steven Burroughs, an independent researcher and writer based in Hyattsville, Md., is writing a self-published book on Amiri Baraka and Ras Baraka through the eyes of the 2014 Newark mayoral campaign. A native of Newark, he has taught at Morgan State and Howard universities. He is the co-editor, along with Jared Ball, of A Lie of Reinvention: Correcting Manning Marble’s Malcolm X and the co-author, with Herb Boyd, of Civil Rights: Yesterday & Today. He can be reached at toddpanther@gmail.com.